In 1900 New Zealand annexed the Cook Islands. 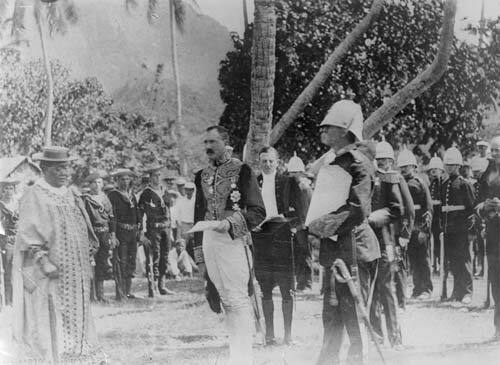 Here, Cook Islands Queen Makea is shown listening to Governor-General Lord Ranfurly reading the annexation proclamation, with British Resident Walter Gudgeon. In the background are British bluejackets and marines. From the 1880s islands within the Cooks group had been part of a British protectorate. Annexation meant that the boundaries of New Zealand were extended to include the Cook Islands, which were administered by New Zealand until 1965. They then became self-governing in free association with New Zealand.